"The two-and-one-half-story Asa Craig Residence is an excellent example of the Queen Anne style. It rises from a cut fieldstone foundation with heavy mortar joints. The first floor is sheathed with clapboard siding, while the upper story-and-one-half is covered with decorative shingles. A hipped-roof, front porch wraps around the southeast corner of the house, while another hipped-roof porch fronts the rear, eastern entry. Both porches consist of turned, wooden posts, spindlework, and a simple, wooden balustrade." "The Pearl and Grand Avenue Historic District is a small residential neighborhood that consists of twenty-four resources that span in time from 1892 to 1954. The district area itself is located north of the Mukwonago business district and runs from 200 to 306 Pearl Avenue, 311 to 417 Pleasant Street, 315 to 425 Grand Avenue (not including 424), and 403 to 423 Division Street. All four streets/avenues are lined with mature trees and, combined with the associated buildings, the area projects a sense of time and place. Twenty-one of the twenty-three buildings are residential in function; while two of them were originally parsonages. The final two buildings are also religious in nature and include a church and an associated former school. One property contains a garden folly, which, because of its substantial size, is included in the resource count. Only one of the twenty-four resources is considered to be non-contributing because of substantial alterations. "The medium- to large-sized lots of the district's buildings are landscaped with many large, mature trees, along with shrubs and other plantings and the setbacks of the homes are generally consistent. Architectural styles found in the district reflect the common styles and forms popular in Wisconsin from 1890 to 1950 and include Queen Anne, Colonial Revival, American Foursquare, and the bungalow. Homes within the district are generally two stories in height; the majority are topped with a truncated hip roof—a distinction of Mukwonago architecture. 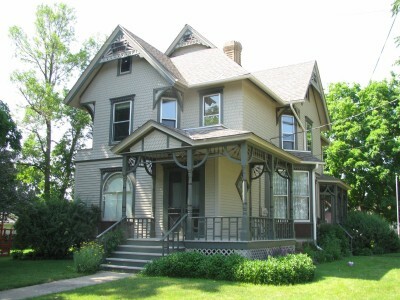 The most common type found in the district is that which is rectangular in form, is topped with a truncated hipped roof and features a coved eave—the latter is another distinctive characteristic of architecture in Mukwonago. Original materials utilized in the district include rock-faced and decoratively stamped concrete block, clapboard, brick, and fieldstone (with thick mortar joints)—the last material is used liberally throughout the village for foundations and porches and is another hallmark of the community. "Nearly all of the homes have associate garages; most are from the historic period and retain their original sheathings such as drop siding and rusticated concrete block. Indeed, four of the homes feature a larger, carriage-house type structure. None of the garages is included in the building count. "The boundary was drawn to enclose the best concentration of historic residential and ecclesiastical architecture that make up the historic streetscapes with the fewest intrusions and non-contributing elements. The boundary was drawn in all directions to exclude concentrations of altered, non-contributing buildings." Adapted from the National Register of Historic Places Inventory-Nomination Form prepared by Traci E. Schnell/Architectural Historian, Heritage Research, Ltd., dated August 14, 1974. A link to the document is listed below in the "Sources" category. Portions of some photo captions come from the same document and are indicated with quotation marks.